To make each little light visible within the vast urban jungle, Aristotle Roufanis has deployed a technique of super high-resolution photography, which is then complemented by meticulous digital editing that can take up to one month for each photo. The images for the Alone Together series, when presented in an exhibition context, are shown inextremely high-resolution prints that are at least 160 cm and up to 5 metres wide, in order to convey as much detail as possible. 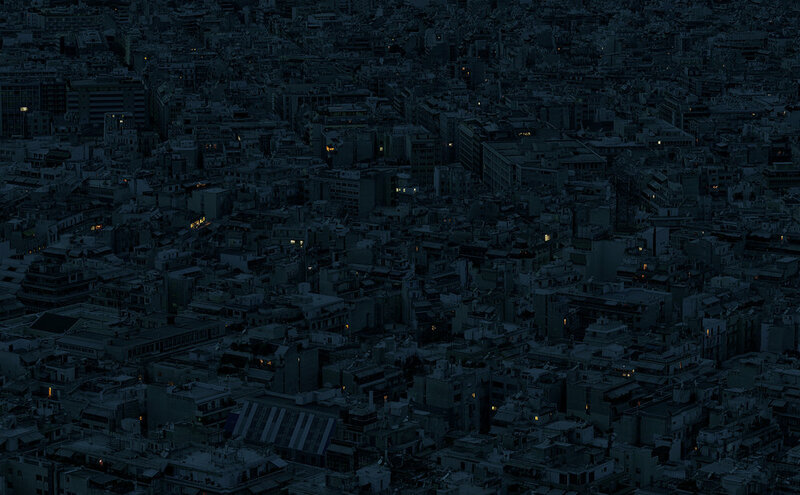 This enables the viewer to explore different areas of the image, and perhaps identify with particular lights or even people seen in the photos: the resolution of the images is so high, that tiny figures can sometimes be seen standing in the windows, perhaps contemplating the city outside or doing everyday things in their home.